MotoXAddicts | Inside Story: Dean Ferris Interview – USA in ’19? Inside Story: Dean Ferris Interview – USA in ’19? 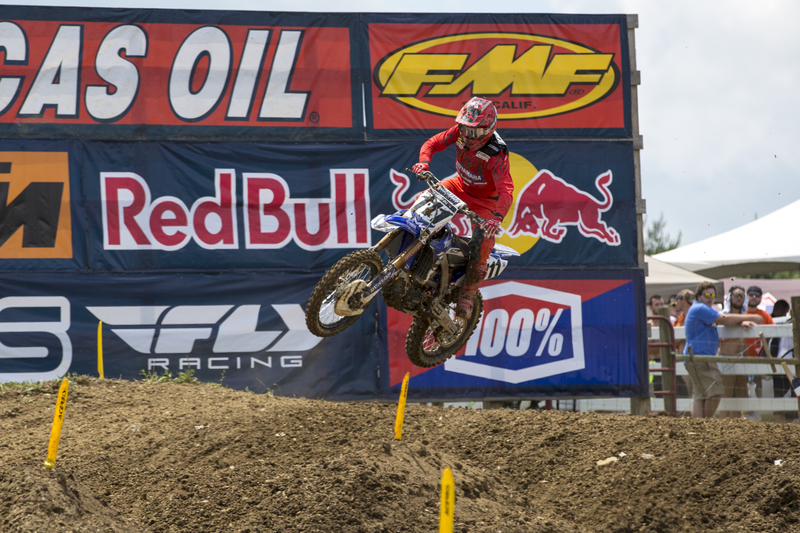 Dean Ferris is already known worldwide for his GP victories, a stunning runner-up place in a wildcard ride in a moto of the AMA Nationals in 2017, and his stunning 2013 performance at the Monster Energy Motocross of Nations, when he battled the likes of Ken Roczen and Eli Tomac in the MX2 class. The former Grand Prix winner has set his sights on the 2019 AMA 450 championship, and before you wonder who he will ride for, stop wondering, because not even Ferris knows at this stage. Still, with a shortage of good motocross riders in America at the moment, and with its depth at an all time low, the AMA Nationals should welcome a rider of Ferris talent, and if I was a betting man, I can see him racing for a factory team, and putting up a lot of top three finishes. 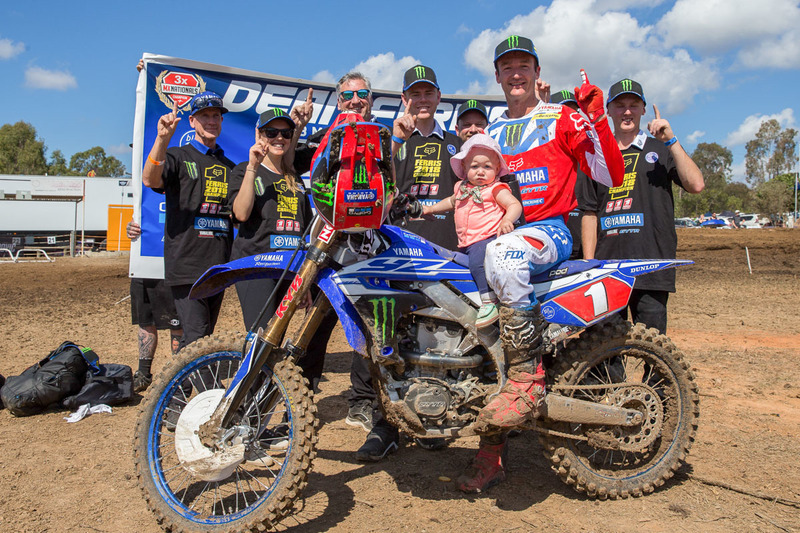 We caught up with Ferris as he ended his Australian Motocross Championship series with another title, and started preparation for the Australian Supercross Championship, which will commence in a months’ time. How many Aussie titles you got now? That isn’t more than Craig Dack (his boss) is it? Tell me about your weekend. The first guy to ever win every round of an Aussie title. Well, I wrapped up the title in the previous round and this round I was able to make it a win in every round. Obviously the big news is you going to America. How did that come about, and obviously last year you had that good result in the AMA National you attended, and nothing came of it, so why go this year? I actually don’t have a deal yet, but I have announced that I won’t sign a deal in Australia, because deals are getting done, and the plan is I am a free agent and I want to go for a deal in America. Oh, ok, I thought you already had a deal in America. Is that not the case, or are you working in something that you can’t announce? No, I really don’t have anything, but I am working on deals now, but as of this moment I don’t have one. Dean shocked the world for Team Australia back in 2013. To leave Australia, you must be confident you will get a deal done? I am, and hopefully after my performance last year, I should be able to get one. So at the moment, I don’t have a deal, but we are working on it. And you are looking for a motocross only deal? Now that you have decided to go in 2019, will you compete in any AMA National rounds now this year? No, I am committed to doing supercross in Australia and its time to get ready for it and its just around the corner, and that is also why I am not doing MXoN. Doing supercross in Australia, and only wanting a motocross deal in America? 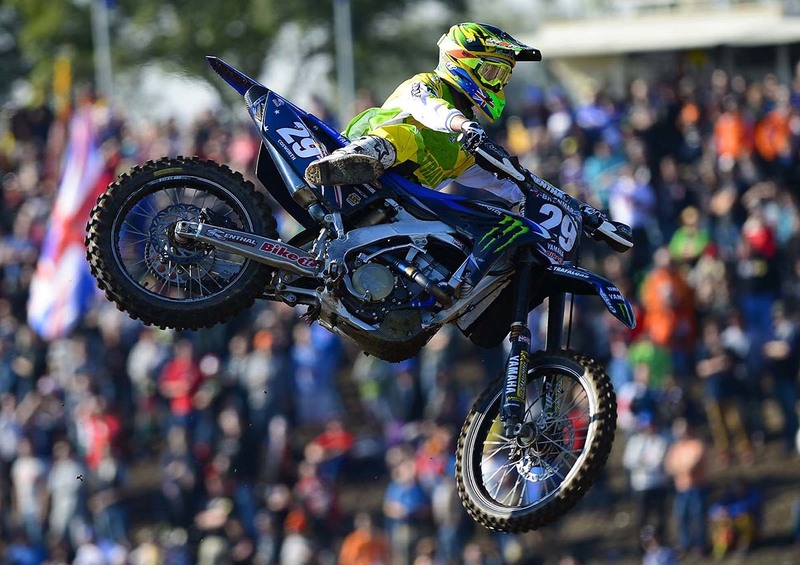 Is it possible you will do some supercross in America in the future? No, I want to focus on Outdoors over there. We seem to see it more often these days that some guys in America are great at supercross, but not that great in motocross. So I guess you think there are enough teams to pick you up for racing just motocross? It is too early to tell, and obviously supercross is the teams focus, but I think I bring a lot of value being decent at motocross and having my body ready to motocross and I think I will bring some value to somebody. In motocross it seems the depth isn’t that great. If you look at Jake Nicholls, he isn’t racing GP anymore, but he went to America and finished top ten. A guy like you, in the peak of his form, should be easily a top ten guy, probably a top five guy, and maybe even a top three guy. Look, I know I will be at the pointy end, but a number where I will finish, I don’t know, but I have shown that one race out of a suitcase, I did well, and I think if I get on a good program, and not have jet lag or whatever, then I think I can do really well over there. Talking about being on the road in America, and having a good program, I know you have a small girl, and I think from memory you have another on the way. That’s a pretty daunting taste travelling America with two small kids. Yes, of course, but here, there or anywhere. I am a boyfriend, a father and a motocrosser, and it doesn’t matter where in the world that is. My partner is really excited to go with me and supportive, and as for my daughter, she loves being around motocross. Obviously with two kids, we couldn’t travel together every weekend, but we will come up with a good program, and we will make it worth. My little daughter doesn’t know any different, in fact the week after her birth she came to the next round of the National. Straight from hospital to the track. I am still trying to get it around my head that you gave up Australia and a good deal there, not knowing if you have a deal in America. You must be talking to some teams. Can you give me a number on how many? No, I have an agent on the job over there, just recently and it’s too early to say. I am not holding back Geoff, but my focus is to go there, and not be in Australia. It doesn’t matter how it happens, but I will make it happen. Obviously in Australia you were head and shoulders above everyone else. How is it in Australia as far as young riders coming through? Yes, there is actually. A couple of young fellas. Young Mitch Evans who is just 19 finished second to me in the 450 championship, and he is riding the 450 really well and he is a big talent and somebody to look out for in the future. I think with me gone, it will be better racing and it will be good for the sport as well. Everyone will be gunning again. The last couple of years I really dominated, and it is time for me to go, but its also an exciting time for Aussie motocross. I was speaking to Todd (Waters) at Lommel last week, and he mentioned he hasn’t heard anything form the Australian Federation about MXoN. I know you are not going, but do you know anything, if the team is being picked soon? I have no idea, to be honest. I would have thought they would have announced already, but I have no idea. I stay out of that until I am on the committee, I won’t worry too much about it. 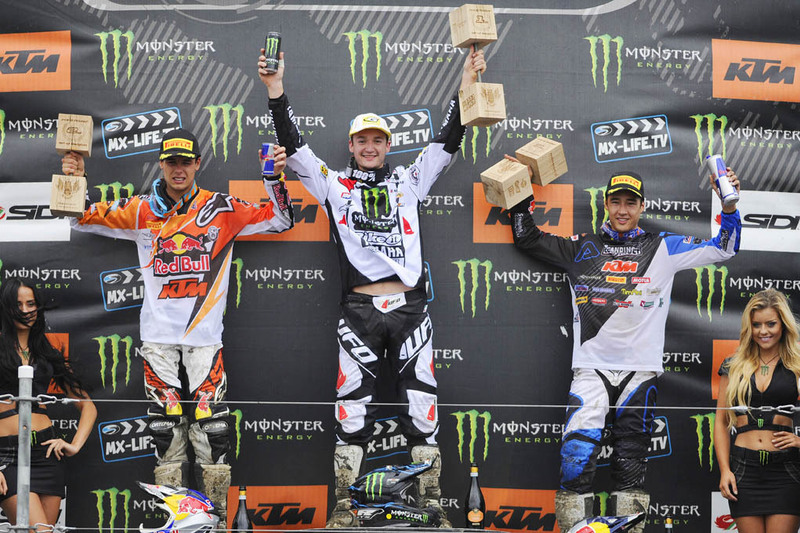 On top of the podium in the MX2 class in the MXGP World Championship series. Just a couple more questions. I am guessing you watch both the AMA Nationals and MXGP highlights, or something like that. The whole Tomac vs Herlings battle for the MXoN, what do you think happens there? I watch the whole thing, every lap of every race. I do all my training indoors on a cycle and it gives me a lot of time to watch the racing. I mean its going to be at Redbud in America, but still, the way Herlings is riding right now, I would have to put my money on Jeffrey. I have to admit, I started following motocross in 1971, saw DeCoster ride, Geboers ride, Everts, Carmichael, Stewart and many others. I have been following the GPs and AMA as a media guy for more than 25 years, and I have many moments where I am asking myself if I ever saw anyone ride like Herlings is now. So aggressive, but smooth and really timing everything so well. How do you see that? I have to agree with you Geoff, watching him ride is just unbelievable. He has the perfect technique and is such a big strong guy and he is doing things that nobody has ever seen before and its really nice to watch. Ok, thanks Dean and I hope you get something together. Thanks mate. I will keep you in the loop. I made up my mind ages ago I wanted to go, and how it happens I don’t know yet, but hopefully I get a factory bike and a ride and get it set-up early.